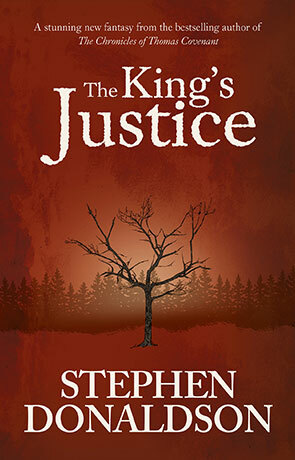 The Kings Justice is one of two new stories released this month from one of the veterans of the Fantasy scene - Stephen Donaldson. It's a tale of an enigmatic figure known only as Black who goes in search of evil deeds. He has powers that help him route out evil, not least the ability to manipulate people to his will. He can also sniff out the bad and often trace it back to it's source. The Kings Justice see's Black investigate a murder in the sleepy village of Settle's Crossways which as you might expect turns into a much more serious issue than first suspected, involving the collection of people internal organs for some sort of magical ritual. Nothing good can come from such a thing and it's up to Black to prevent it by any means possible. It's a short (novella length) story that moves forward consisently and at a good pace, there is little wasted space. The writing is of the quality anyone having read the authors work might expect but it's kept concise with little of the authors occasionally overdrawn descriptive prose. It has a wonderfully dark, violent feel to it and the story really draws you in, not least due to the character of Black but also the nicely paced plot. There is glimpses of the bigger picture and the author does a wonderful job of building this magical world without big backstory or exposition. Surrounded by large fantasy epics, it's nice to read something short and sweet for a change. The Kings Justice is a great little story, a perfect distraction from one of the great fantasy authors. Written on 29th June 2016 by Ant.